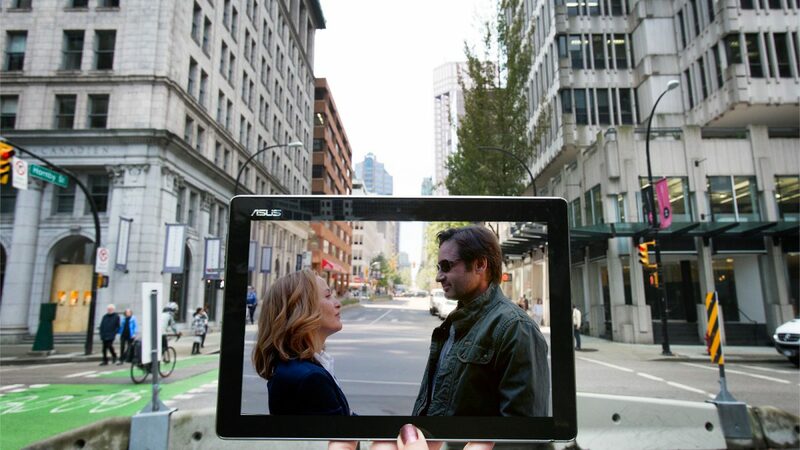 Dana Scully and Fox Mulder meet up in downtown Vancouver. 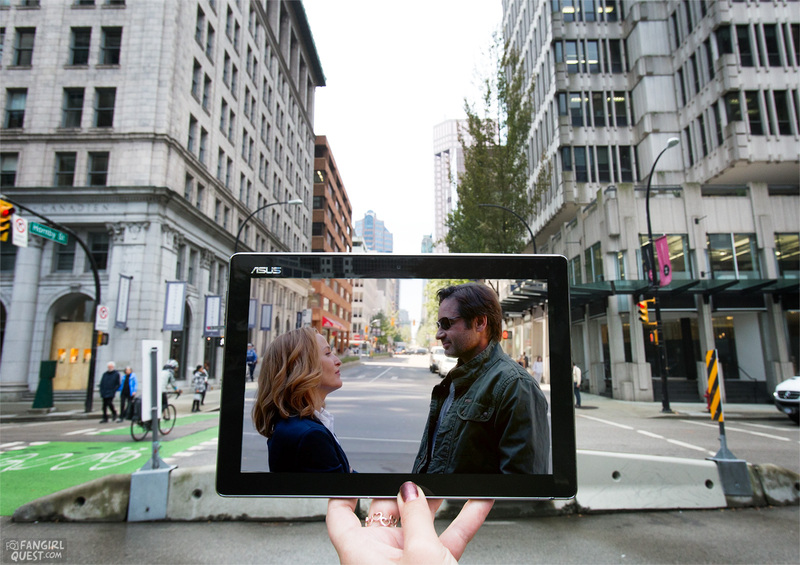 This The X-Files filming locations post is part of our bigger Vancouver filming locations guide! 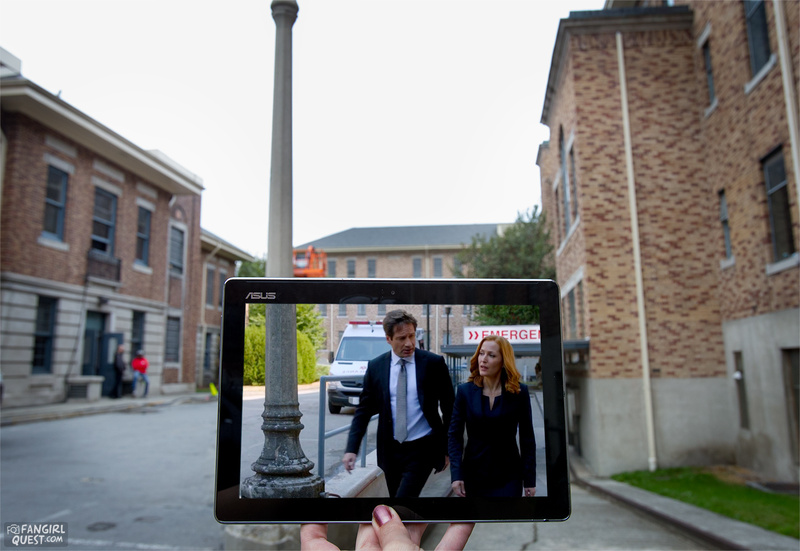 As part of our Vancouver Filming Locations Guide we’ll take a quick look at the locations used by The X-Files. 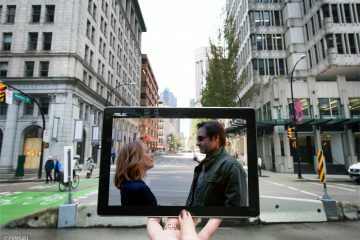 We’ve visited many of them, so along with a few nice recommendations for any Mulder & Scully fans traveling to / in Vancouver we’ll also include some sceneframing photos from the locations! Open the map legend on the left (the little icon on the upper left corner of the map frame). Below the map, you’ll find a list of locations matching those titles with some location photography and sceneframes. The X-Files locations are all dark grey, while other colors represent other shows filmed in the area. Happy location hunting! Scene: This is where Dana Scully and Fox Mulder meet up for the first time in awhile. They’re then joined by Tad O’Malley who offers them a ride. 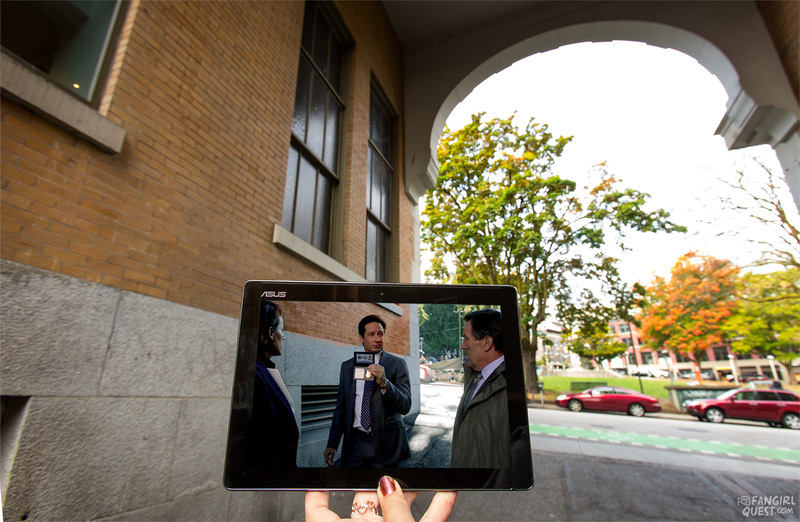 The X-Files filming locations downtown are the easiest to get to and this one’s no exception! It’s also quite an iconic one! As we were standing there on this street corner, lining up the tablet for the shot, we heard a happy shout: “Fangirl Quest!” and turned around. Turns out, one of our Twitter followers recognized what we were doing. Amazing!! We’ve met her before a few years ago on the Supernatural set but what are the odds of meeting again so randomly? So much fun to chat with you again, Stacey. Scene: Mulder meets with an old contact and asks about his new theory. 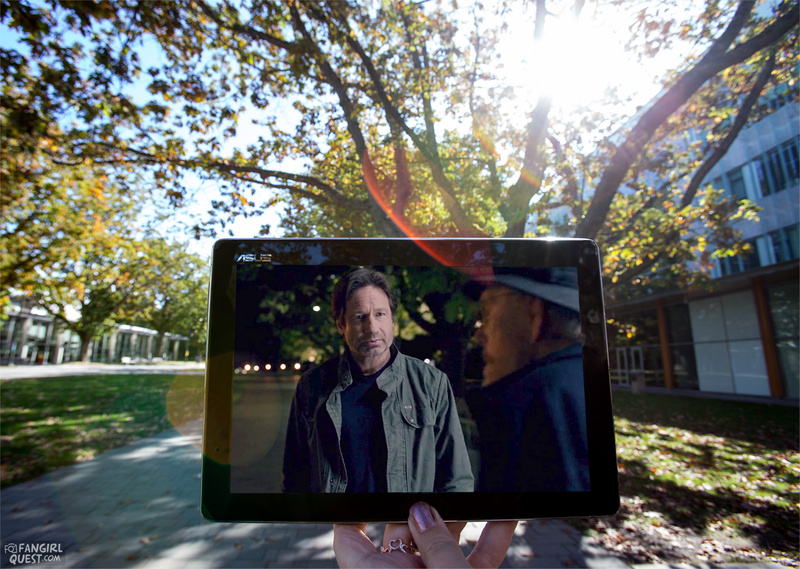 The UBC recently also starred on Legion so we sceneframed both just about a hundred meters from each other. It was a chilly day, but a walk around the campus was a really beautiful one. Knowing we were walking in the footsteps of all these amazing actors (and characters!) made it even more special, of course. You can check out our Legion filming location guide here. One of the X-Files filming locations we didn’t visit due to lack of time, but let’s list it anyway just in case someone’s curious. 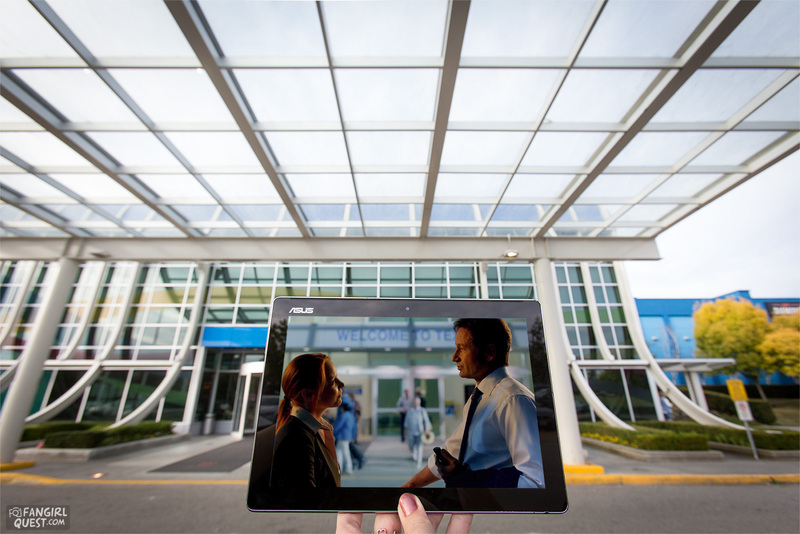 As most shows that film in Vancouver, The X-Files have used several of Riverview Hospital’s buildings for both exterior and interior shots. 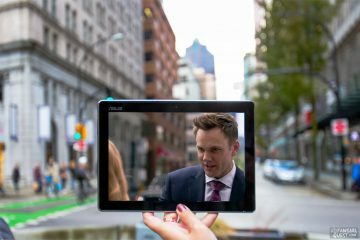 On the left, you can see the blurred shapes of some dudes working for a filming crew and behind the tablet, we had a security guard keeping an eye on us as there was yet another film crew in the building on the right! Up the hill, we bumped into Deadpool 2‘s set (!!!!). They weren’t actually filming anymore, but there was still a lot of equipment and all sorts of pieces of set left behind to wait for the clean-up. 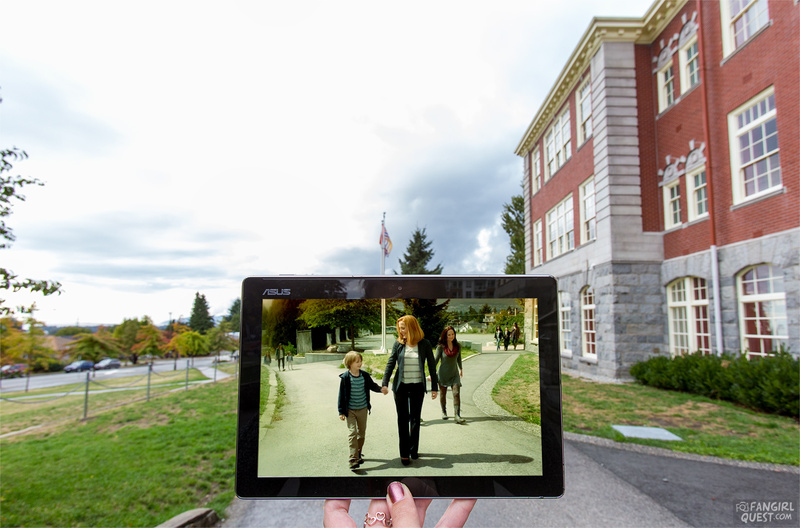 Scene: It was the Queen Mary Elementary School in North Vancouver where they filmed Scully taking William to school in her dreams. Standing in front of this school broke our hearts a little bit. This over a hundred years old building is a stunning one and there’s a nice view of the Vancouver Harbour area from the gates. 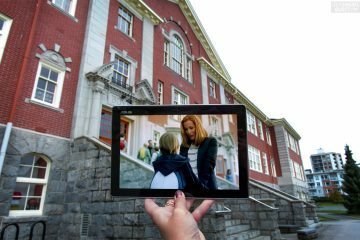 However, we remind any fans touring the X-Files filming locations to be mindful as it is a operating school. It might be wise to avoid going during the weekdays and stick to evenings and weekends. The X-Files filming locations: Scully dreams of taking William to school. 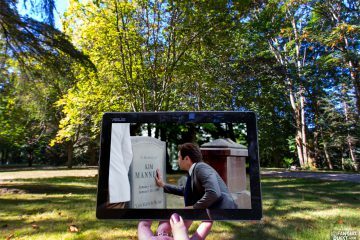 Scene: Mulder finds Guy Mann at the cemetery and gets the whole story out of him. Even though they filmed in an actual cemetery, most of the gravestones you can see in the shots are fake. The fake stones are usually used simply out of respect: not everyone would be pleased to see their grandma or some other loved one star in a scifi show in this way. Among the stones, they even placed a little tribute to Kim Manners, a producer / director who sadly died of lung cancer in 2009. Manners worked on both The X-Files and Supernatural and is often still referenced by the cast and crew. Our trip to North Vancouver Cemetery turned into a forest adventure as another big favorite, The 100, was filming in the area that day. We were curious to see if we could see them in action and ended up hiking along a beautiful forest path for 2 hours. Even though we didn’t spot any filming crews, we did get a good forest walk and some exhausted giggles out of it! An alleyway just off Cambie St at Victory Park. Not the prettiest of locations but hey, at least it’s easily accessible! The park across the street looks like a nice spot for a little takeaway lunch, too. One of the more beautiful locations for The X-Files. A beach park with seaside trails with totem poles, tennis courts, playgrounds & a picnic area. The tree trunk Mulder & Scully sat on is still there, but it’s been slightly moved so it was impossible to align all the lines perfectly. We managed to do a decent job anyway! 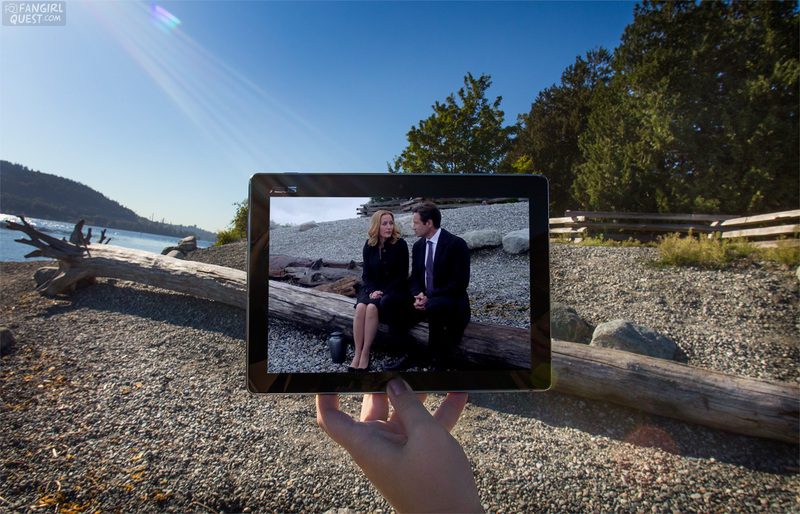 Mulder and Scully at Cates Park in North Vancouver. Scene: Miller picks up Scully and later Einstein picks up Mulder at the airport… which is actually a casino. If you’re into gambling, this location is for you. We only went there to get these shots and even had a few we wanted to take inside. However, due to security reasons, we weren’t allowed to. Happy we got the exterior ones, though! 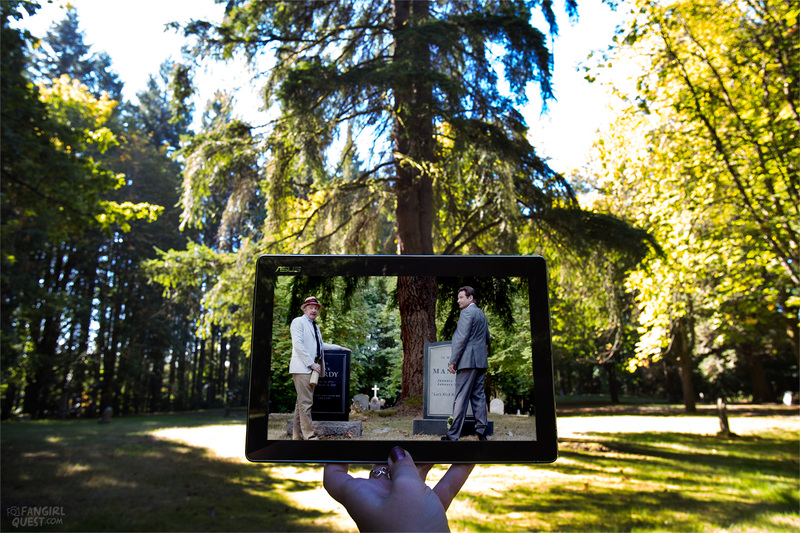 One of the easy access The X-Files filming locations! You can spot this square in many productions, including the older X-Files episodes and Smallville. 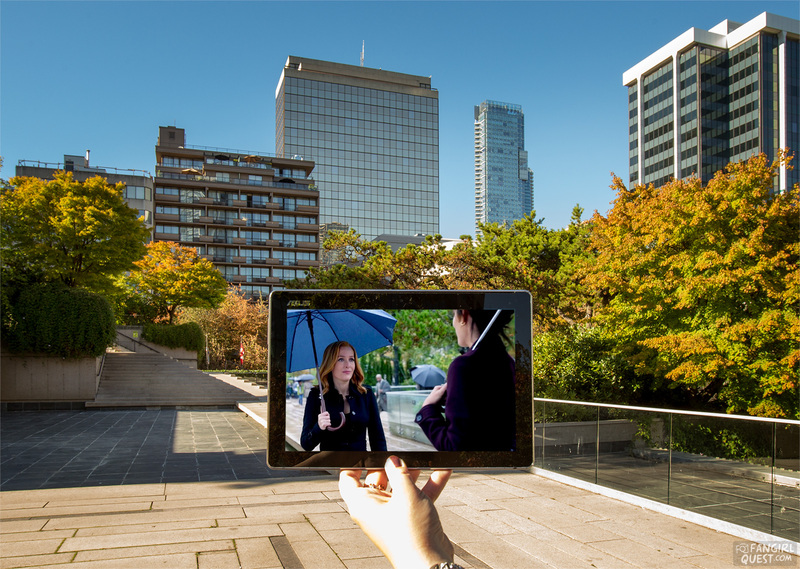 Dana Scully on Robson Square, Vancouver BC. Oh, man! We actually drove down here to get some sceneframes done, but it never occurred to us to check the opening times… and it was closed. This one would’ve made some pretty amazing shots, ha! Time for some big love… Although most of our travels are independent and self-planned, we do owe some thanks to a few helpers: MovieMaps for pointing us the right way, KLM for helping us get to the right continent and Hertz for making it easier to access the out-of-town locations. You guys are rockstars! Thank you, thank you, thank you! Do you know if the boat that is used in the episode, Ghouli Is the same boat as used in a recent episode of supernatural?